Ruby Falls Weeping Redbud Tree is November 2018 Plant of the Month – Glacier View Landscape and Design, Inc.
Wow! What a garden stunner! 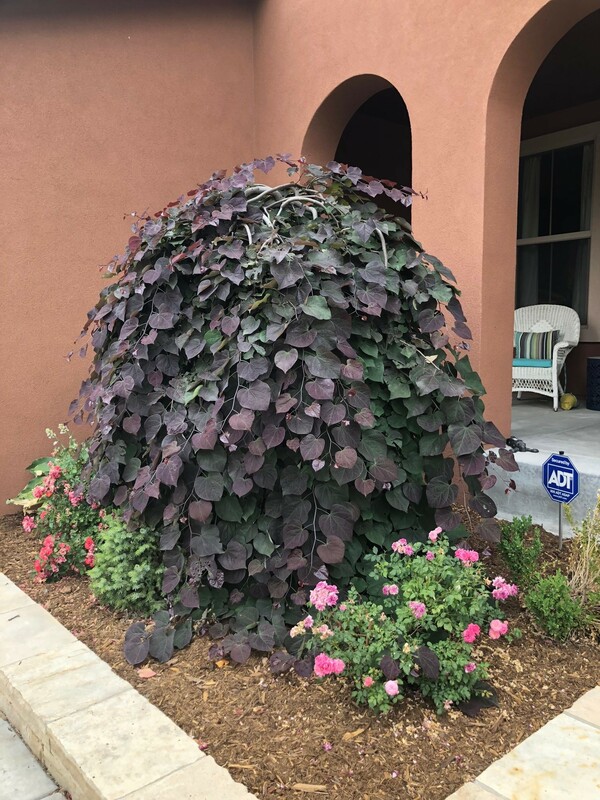 This new introduction from North Carolina State University is a fabulous blend of deep maroon, almost black color and the weeping habit so many landscapers like to show off in that special intimate garden spot. This plant fits the bill. It comes alive early in the spring with an abundant display of small pink blooms on leafless branches, then pushes out dark green to maroon colored leaves that turn lighter as the summer progresses. Late in the summer, they will begin to turn to green, and end the season on that note. This is a dwarf cultivar of Cercis canadensis or Eastern Redbud. Maximum height is about 6’ and 3-4’ wide. Pruning should be light to none since it is a slow grower. Remove only dead or damaged branches. In our Erie, Colorado landscapes, it can handle direct full sun, but a bit of protection from west winds might help. So, planting on the exposed south side of a property where it is subjected to passing west winds might not be best, but western exposure is fine against a home. It can handle partial shade, and possibly deeper shade, though blooms might not be as strong as in full sun. It likes a well-drained loose loamy soil, so good amendments to our clay soils is a must. It likes moderate water and should not be allowed to dry for significant periods. Remember, it comes from the Eastern Redbud which has a limited natural span in the Eastern US that does not include Colorado due to our low humidity and lack of natural rainfall. So, an occasional wetting of the mulch underneath it may help humidity levels around the plant. Ruby Falls does not transplant well. Buy as a smaller specimen in #10 or #7 size pots and plant once. Successful transplants are rare. Bamboo staking is recommended for a couple years until it holds its own weight. Have Glacier View Landscape find and plant a few for you in that special location sooner rather than later. Remember, the best time to plant a tree was 20 years ago….the next best time is now! Thanks for reading! Contact Dave to learn about a free consultation and estimate for your local Erie or Boulder, Colorado area landscape project and follow us on Pinterest or Facebook to see our featured landscaping project photos.